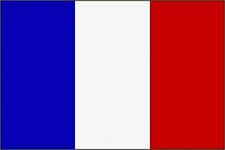 This led to the situations when the French soldiers often were forced either to buy privately the replacement boots at their own and pay shipping from France, or to buy locally made boots directly from vendors on-site. Theater-made boots were often of different colors (from dark brown to light sand) and often showed full absence of any identifying marks and manufacturer's labeling. 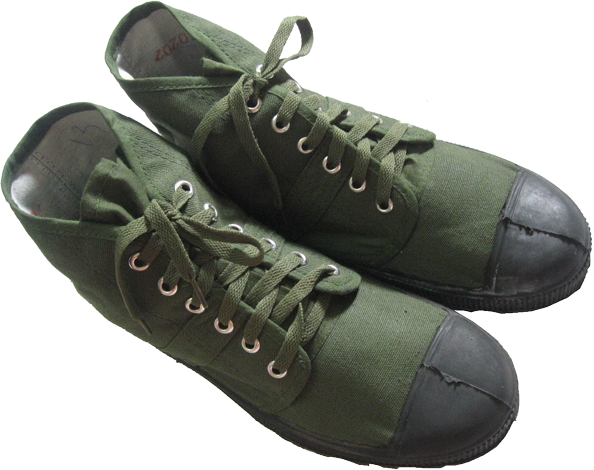 Sometimes they had to use simple "Converse"-like sneakers (it often happened during the conflict in Indochina), or even the captured trophy boots, among which the best quality canvas boots were those made in Egypt for the Algerian National Liberation Front guerrillas. For many years, during the colonial wars in Indochina and North Africa, the "Pataugas"- type canvas boots had been an integral part of the image of the French soldiers and legionnaires. The colonial wars of France in Indo-China, of course, had an impact on the uniform of all the countries, involved in the regional conflicts. Different official issue French-made boots were sent to the South Vietnamese army as the French aid. 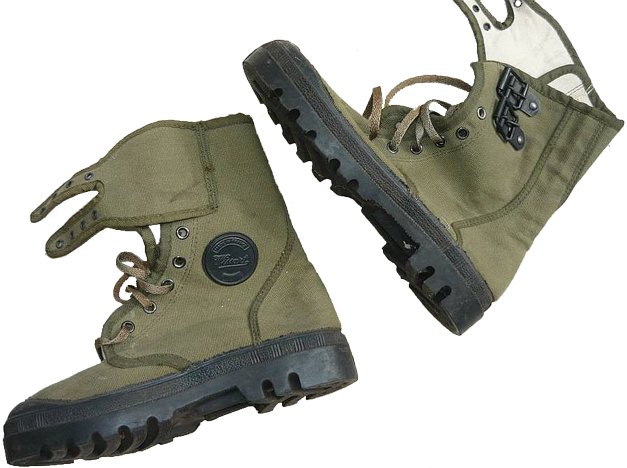 As for the military canvas boots, Vietnam, the most belligerent country, managed to start the production of analogues of the French canvas boots, however, with the addition of some local innovations. 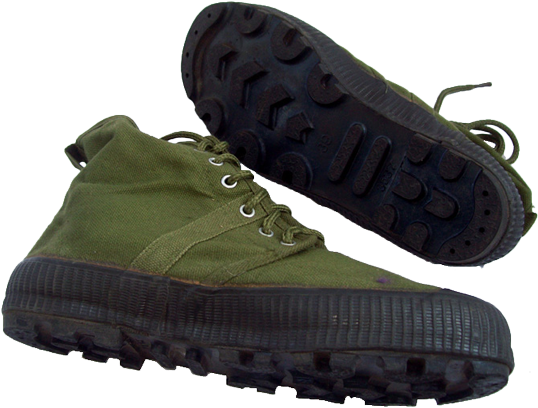 The Vietnamese version of "Pataugas"-type "Pampa" boots are made of green canvas and looks more roughly made than the French ones, especially concerning black rubber sole, the tread pattern of which, judging by their appearance, represent by itself a combination of ideas, borrowed from different French manufacturers. Thus, the half-ring-shaped lugs along the edge of the foot are definitely borrowed from "Aigle" tread pattern, while the angular-shaped central elements were taken from "Palladium", as well as two transverse elongated rectangular lugs in the middle part of the sole, just near the heel. 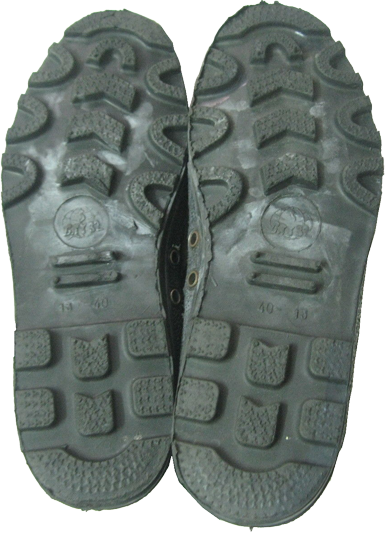 These elements of thread pattern are intended to absorb the load in the middle of the foot, and thanks to them the sole of such boot is not flat, but correctly anatomically curved. However, the borrowing of transverse elongated rectangular lug turned out to be some timid, and these lugs appeared to be too small and thin. Nevertheless, they managed to compose a distinctive "Vietnamese" tread pattern, which was different from all the other patterns, and this allows to distinguish the "friend" and "foe" footsteps on the ground. 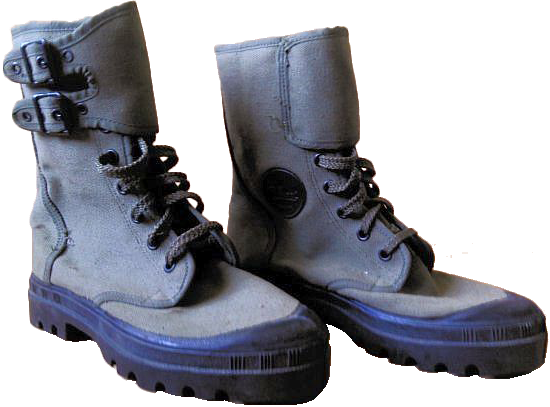 The Vietnamese also "borrowed" from the American "jungle" boots the idea of double eyelets at the inside shank of each boot. These brass drainage eyelets, intended to allow water to drain out and to permit air to reach the feet inside the boots, were not screened with fine mesh, as distinct from the Americans "jungle boots". 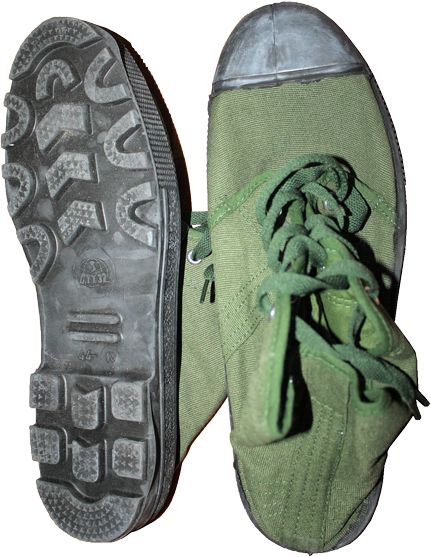 This simplification made possible the ingestion of insects inside the boots, but made the boots production cheaper. The manufacturer's labeling logo can be found on the sole, depicting the globe and the contour of Vietnam, and the manufacturer's code (for example, CTY 32 and 32 BTY, as well as the size and width ("44-13" and "40-13"), arranged in a mirror manner on the left and the right boot.